When we first set up C-Pro Direct in 2005, we were very aware that we were also being given an opportunity to help children with clubfoot in underdeveloped countries. We have a son who was born with clubfoot in 2004 and we are very conscious that he was ‘lucky’ to be born in a time when the Ponseti method was available in the UK, and could have the best of treatment. However, many thousands of children around the world are not in this fortunate position. We have been determined, ever since we set up C-Pro Direct, to ensure that wherever possible, we would do what we could to help these children. We hope that by reading the following examples of work we are doing with various charities, you will get a sense of the commitment we have to helping children with clubfoot around the world. We totally support the Ponseti method of treatment which has transformed so many lives. Our charity work aims to support this treatment – whether by donating sandals and bars or ADMs, or by sponsoring clinicians to attend training courses and other events. If you have items to donate, please send them to: Charity department, C-Pro Direct, 7A Enterprise Way, Edenbridge, Kent, TN8 6HF. Please see below some of the charity projects we have sent the donated items to, as well as details of the training days we have sponsored and provided medical models for. The Clubfoot Pilipinas Boot Bank is a non-profit community page via Facebook to help families who cannot afford boots and bars. The page Administrator keeps a stock of all sizes of boot and distributes to Clubfoot children free of charge. C-Pro Direct sends this organisation a large charity shipment every few months. Most recently, C-Pro Direct collaborated with Steps Charity to send a stock of charity items to Les Pieds du Maroc, a Facebook non-profit community page for families in Morocco. 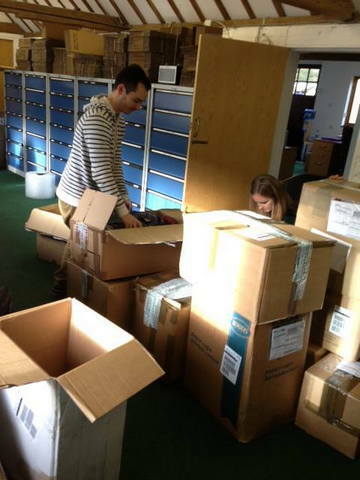 Paul Norton from Steps Charity came in to help Sophie, the Charity Co-ordinator, pack a large shipment of boots and bars for this organisation. C-Pro Direct will continue to help this page and send charity shipments in the future. Infant Clubfoot Appeal (ICA) is working in Zanzibar, Tanzania, bringing the Ponseti treatment method to children with Clubfoot. In addition they are training local staff, to build their capacity to provide long term sustainable treatment to children with Clubfoot. The ICA are also providing treatment for older children who are suffering the effects of untreated Clubfoot, providing crutches, wheel chairs and where appropriate, surgical interventions. C-Pro Direct support fundraising or events for this charity, including the Ponseti Walk Menorca 2014, which took place in May 2014 (see below video), where members of the C-Pro Direct team helped and completed the walk for the charity. 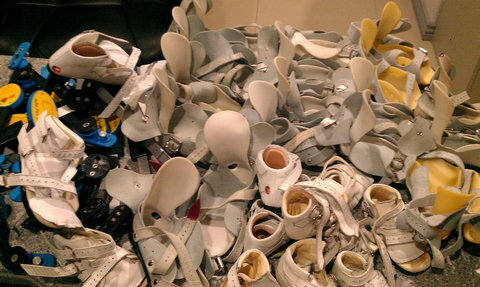 To continue to support training which enables treatment to be given to children, C-Pro Direct have sent many boxes of used sandals and bars to stock their clinic, as well as a recent shipment of used orthotic devices such as Piedro boots, spinal braces and head guards to help the clinic staff to treat other orthopaedic conditions. 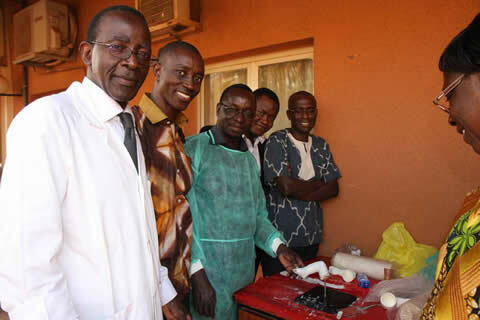 In December, C-Pro Direct sent a donation of training models and charity items of sandals and bars to Dr Abu Amara, who is helping set up a clinic in Burkina Faso, West Africa. The first training event successfully took place from 17th-24th January 2015, and we will continue to regularly send charity items to this worthwhile project. The goal of the Clubfoot Shoe Exchange Belize is to link Belizean Families with other families who have children with clubfoot so they may be able to trade, give and receive the proper sandals and bars for the Ponseti method of treatment of clubfoot. 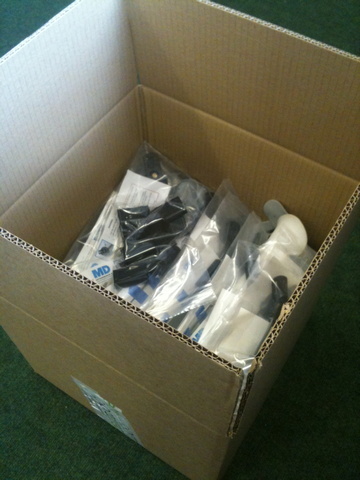 C-Pro Direct have sent two shipments of used sandals and bars to this organisation to help it set up the exchange. Philippines Clubfoot Shoe Exchange is a Non-Profit Community Page via Facebook to help Filipino children with Clubfoot. Their aim is to seek donations of sandals and bars from other countries like US, UK, Australia, Canada & other highly developed countries worldwide. These then get distributed to families that cannot afford them. C-Pro Direct have sent shipments of used sandals and bars to the Phillipines Clubfoot Shoe Exchange, most recently sending them two large boxes to for distribution amongst children with clubfoot. STEPS is a regional non-profit organisation working for the alleviation of clubfoot in Southern and East Africa. Their goal is for every child born with Clubfoot to have equal access to the Ponseti Method. C-Pro Direct have sent quite a few charity shipments to help all of the hospitals, but our most recent one was twelve boxes of used orthotic devices, such as head guards, spine braces and Piedro boots. Karen Moss, Executive Director of Steps Charity, distributed these boxes around the orthopaedic hospitals. Both miraclefeet and STEPS collaborated to get a clinic set up in Botswana. This initiative is driven by a Botswanan mother, who travelled to South Africa for treatment of her son who was born with clubfoot, because there was no Ponseti treatment available in her home country. In June 2013, STEPS SA in partnership with the Botswana Ministry of Health, hosted a training event with 25 delegates from all over the country, led by experienced doctors from South Africa. The training was very successful and the first Ponseti clinic started in July at Princess Marina Hospital in Gaborone, the largest hospital in Botswana. C-Pro Direct sent training models to support this event. miraclefeet is dedicated to providing proper treatment for children born with clubfoot in developing countries. miraclefeet partners with local orthopedic surgeons working in public hospitals to establish and support clubfoot clinics within the existing public health system. miraclefeet believes this is the most effective, efficient and sustainable approach to prevent the significant disability caused by untreated clubfoot around the world. C-Pro Direct sent a large shipment of 147 used sandals and bars to stock their Clubfoot clinic in Nicaragua, We received the above thank you letter for this shipment. Madagascar, a country of 24 million people is estimated to have over 15,000 children and adults suffering the disability of neglected clubfoot, with nearly 1000 babies being born with the clubfoot each year. Steve Mannion was invited to conduct training courses and demonstrate neglected clubfoot surgery at two centres in Madagascar, as CBM is determined to eliminate clubfoot disability in Madagascar. 25 practitioners attended the course, a combination of surgeons, rehabilitation doctors, physiotherapists and orthotic (brace) technicians. C-Pro Direct supplied the training models for this course. Feet First Worldwide was established in 2004 by Consultant Orthopaedic and Trauma Surgeon, Mr Steve Mannion. 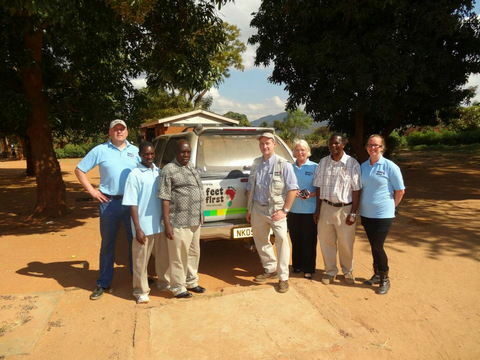 Mr Mannion and his multi-disciplinary team from Blackpool, visited Malawi to treat children with severe orthopaedic deformities and to train local staff in basic surgical techniques and the management of club foot. C-Pro Direct donated training models to this clinic to support their training of the Ponseti method. Both Feet Forward, a charity set up by Ms Naomi Davis, B.Med.Sci., B.M., B.S., F.R.C.S.Ed (Tr. & Orth), aims to treat clubfoot around the world. It also helps with costs of volunteers going out to help projects such as Walk for Life in Bangladesh. 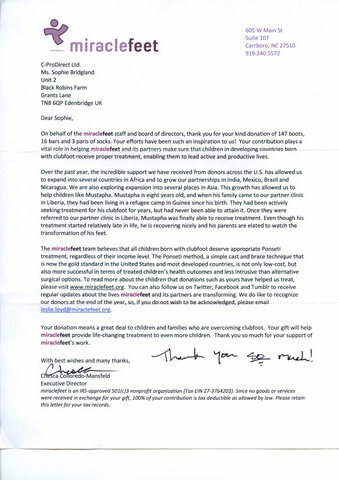 C-Pro Direct have sponsored training events for this charity and continue to support their work. C-Pro Direct has also sponsored many doctors and other medical professionals to attend Ponseti training courses or events. We have also sponsored some medical professionals to attend the Ponseti clinic in Iowa, where they can gain from the experiences of the doctors who continue the great work of Dr Ponseti. C-Pro Direct provided financial support to Dr Pirani and the University of British Columbia of their work to develop common guidelines for the treatment of clubfoot to be made available globally in collaboration with the World Health Organisation (WHO). C-Pro Direct have also provided sandals and bars for a number of children who couldn’t afford them, or who had no access to donated items. We promise to ensure these children have the sandals and bar for as long as they need them. If you are a charity who would like to receive donated, used sandals and bars / ADMs OR if you are a hospital or parent who can donate these used items, please do contact us on 0044 1732860158 or email Sophie@c-prodirect.co.uk.